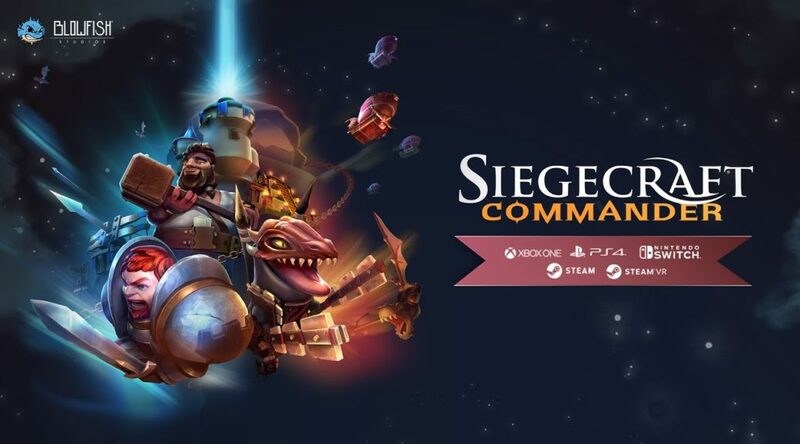 Blowfish Studios has announced it’s strategy action game, Siegecraft Commander, will be released September 19, 2018 on Nintendo Switch. In Siegecraft Commander, players lead an army of troops and construct offensive and defensive structures on the battle field to defeat the enemy. The game is now available for pre-order via eShop for $19.99 USD / €19.99. Watch the trailer and read the first details below. Siegecraft Commander, the action-strategy game hybrid from Blowfish Studios, will hurtle toward Nintendo Switch™ on Sept. 19, 2018. Lead an army of troops on a raging battlefield and construct a network of offensive and defensive structures to strengthen their positions and demolish enemy fortifications. To expand their battlements, players catapult structures across the warzone, creating a web of connected towers linking back to the spires that spawned them and, ultimately, the central base. Every tower must connect to the last or to other structures linked to the faction’s first building. If a link in the chain is broken, everything cut off from the nexus will also crumble, leading to potential domino-esque effects where entire sections can fall with one well-placed shot. Building fortifications is only half the battle. Catapults will launch everything from new structures to explosives and cows, all while deploying infantry to attack the opposing forces. Some placements can even buff towers’ speed and strength with magical auras, making one’s knowledge of the land, along with shrewd aim, and a keen tactical eye key to survival. Two eight-level single-player campaigns starring either a defense-focused band of knights or a tribe of offensive Lizardmen will be presented in a storybook fashion. For those wishing to turn friend into foe, Siegecraft Commander supports local split-screen and online cross-platform multiplayer for 2-4 players between Nintendo Switch™, Xbox One, and PC. Generals can choose between tactical turn-based and action-packed RTS battles. The ability to choose a commander and toy with the tech tree means there’s a strategy for everyone. Siegecraft® Commander is available for pre-order at $19.99 USD / €19.99 via Nintendo Switch™ eShop. The game is also on sale for the same price on PlayStation 4, Xbox One, and Steam for PC, Mac, and HTC Vive.